He was a story that many of us could relate to in part: changing political views (liberal turning conservative, conservative compassionately understanding the importance of the thoughts of others), the understanding of the joy of life, the love of baseball. For those of you who do not know, as a 22-year-old freshman at Harvard Medical School, he severed his spinal cord in a diving accident, leaving him paralyzed from the neck down. He persevered to complete medical school despite the doubts of his professors, reading his medical books on his back with the book opened on a plexiglass shelf above his head. He completed his MD then his residency in in psychiatry, noting this to be a perfect blend of philosophy and science. He became a self-described psychiatrist in remission and turned his enormous intellect to politics and policy. He became one of journalism’s most powerful writers, recognized by winning a Pulitzer Prize, and a television celebrity on Fox News. Is this not something that all of us in health care have seen in our patients? Is this not something that all of us can understand in ourselves. A life well lead. God rest Charles. I will miss you. His words live on. Read them. This entry was posted in CEO and tagged cancer, Charles Krauthammer, Dr. Popovich, Harvard Medical School, John Popovich Jr. M.D., Physicians, Politics, Psychiatry, Pulitzer Prize, Spinal cord injury, Writer by John Popovich. Bookmark the permalink. Dr. Popovich thank you for writing this! He really was a great man and will be missed. 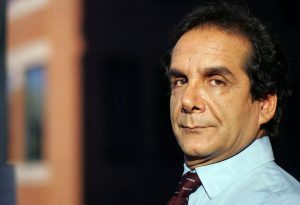 I appreciate your feelings for Charles Krauthammer. I too have listened to him speak, read what he wrote. I was in awe of his ability to communicate his thoughts. Maybe a bit jealous. I hope there is someone who can somewhat fill this void of civility. Nicely done. He was a great man and inspiration. Thank you for sharing. An enormous loss of critical thinking. I so valued his viewpoints–level, fair, and well contemplated. I am an enormous fan of Mr. Krauthammer as well and join you in mourning his passing. He was a voice to trust in a media swarming in sound bites and half-truths. In a world where everyone acts like they have the answer, Charles almost always had the right answer, which set him apart. Thank you for the heads-up on the book. I look forward to picking it up.